For years, YEARS, many of us have complained that GO Transit turned a blind eye to the crap we've had to put up with on trains, so during 2016-17, the agency launched its online #etiquettefail campaign. 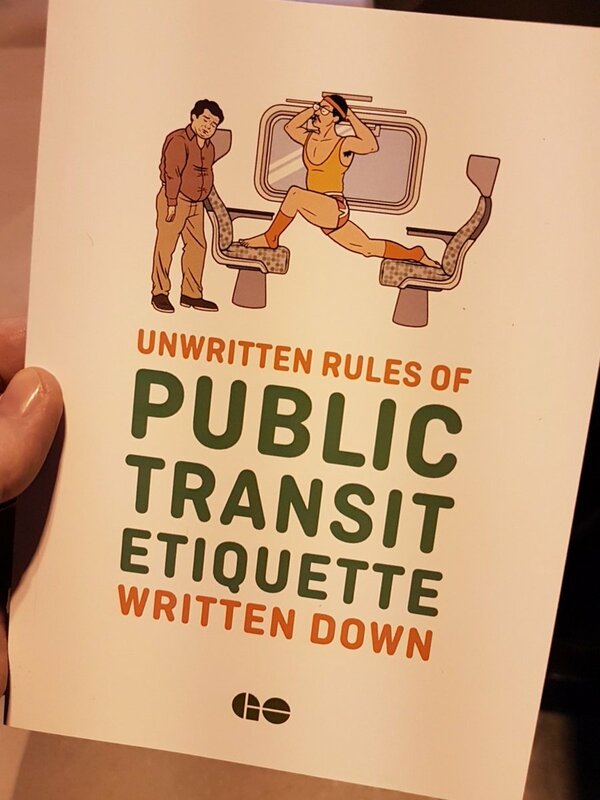 With the help of passengers, and social media users, they compiled the results into a book which can be downloaded for free, or purchased for $5 (to cover the cost to produce the hard copy version) through GO Transit. Only 300 copies were printed. I was given a complimentary copy which is slowly making its way around my office since many of us are GO Transit passengers. People love it. ... So maybe you're insulted you weren't consulted, or maybe you're doubtful real people were involved. I can assure you that they were. Hell, I wasn't even asked to write a goddamn foreword (and if I did, it probably would have been rejected). And if you're comparing this with fixing signal issues, dudes... really? On Twitter, there's all kinds of whining from some who want to know how much this cost, or are angered it even exists because they feel it's a waste of time ... It's not, sorry. You can't cry and throw your arms up in frustration complaining no one listens and when they do, complain about the outcome. GO has a massive Transit Safety division. This group of hard working officers work tirelessly to address abuse and misconduct among passengers. It took a long time but the smoking situation at Oshawa has improved. There are still some who don't get it, but overall, the congregating around the Presto machines to smoke has ceased and smokers have moved to the areas that were created for them to smoke in. We still have a long way to go when it comes to feet on the seats. And even more work to do with Quiet Zone enforcement, but if there's an issue you feel strongly about, please report it by calling 1-877-297-0642 or tweet to @GOTransitSSD on Twitter. It's a cute book but I do wish more effort were put into enforcement rather than raising public awareness. Surely nobody needs to be told that putting their snow-and-salt-covered boots on a seat is in appropriate. Those jerks need to be fined until they feel like it's no longer worth the risk of being caught. I mean, look at the other post you've got up today. You think the "Etiquette Fails" really forces this a-hole into a bit of self-reflection? Or, do you think they should slap him with a steep fine? Which is more effective at preventing this kind of behaviour? Fare compliance is very high on GO even though they only do spot checks every once in a while, because getting caught is expensive and embarrassing. They should do the same for violators of other rules. I mean, I agree that smoking at Oshawa has improved somewhat but for months there was a jerk that was vaping away on the platform every single morning. Worse, there was a small smoking area less than 20m away from where he stood! But why change? He knows GO employees will look the other way, other passengers don't want to be confrontational, and I haven't seen a Transit Safety Officer on the platform for a year or more. Frustrating. I downloaded it last night. Only one comment: "sneezing with mouth open" is a no-no? Not too sure about that.. Someone recently explained why people aren't fine for feet on the seats. As for why Go doesn't use bylaw enforcement to raise revenue the answer is simple. Go transit doesn't get to keep the fine revenue from bylaw offences, those fines are all payable to the Provincial Offences Court in the jurisdiction where the ticket was issued. In fact it costs Go money to issue those fines as they have to use their administrative resources to file them, plus if the matter goes to court they have to pay a GO Safety Officer over time to schlep out to which ever town the trial is being held in to testify. The only fines that Go Transit gets to keep are fines from fare evasion penalty notices and parking tickets. Sometimes that can't be helped! What KPI’s are Metrolinx using to justify continuing with this #EtiquetteFail campaign? Where are the audited measurements of success published? How successful was the laminated etiquette information sheet? Similarly, how successful was the etiquette video? What are the trends? What is out next, #EtiquetteFail — The Movie? You’ll want to take the whole family to this heartwarming story about how our heroines, Cindy and Katelyn, spread the gospel of proper GO etiquette among unruly passengers on a morning LSE all-stops, after it becomes a true ghost train when it halts for a malfunctioned switch and remains stranded for hours, because Operations forgot about them. "Surely nobody needs to be told that putting their snow-and-salt-covered boots on a seat is in appropriate"
I'm glad you spoke up and challenged the inconsiderate rider with their feet on the seat. But I have to ask, will this book change that individual's attitude and behaviour? If GO Transit won't change their ways and provide clean buses for passengers (http://bit.ly/2CTefTD), where's the motivation for passengers like that to change their ways? I will be deeply disappointed if GO's reason for not enforcing its rules is b/c it costs money! Of course it costs money. It's part of the cost of running public transit. It costs money to clean coaches, it costs money to clean bathrooms. You need to enforce the rules and incur these costs to provide the desired level of service. Based on the feedback - it appears that this is desired. G above nailed it. Too many people who don't have the common sense to avoid engaging in antisocial behaviour will not likely change with out associated painful negative consequences. I am @G's newest, biggest fan - well said. And as for GO not enforcing it rules with fines because they don't get to benefit from the fines, you've got to be kidding. I'm pretty sure the police services (and officers who enforce) don't get to keep speeding ticket fines but they still issue them. I personally don't give a damn who gets the money from fines - the only way to get people to understand that a behavior is not permissible is to provide clear and consistent examples of an undesirable consequence (parenting, anyone?) and there is nothing less desirable than being required to hand over more money for something you could easily have chosen not to do.